This pie is old school delicious. This is my mom’s bastardized version of a Betty Crocker recipe and made gluten free with my favorite crust. It has no gelatin for you gel haters! I make it with the lesser amount of sugar in the filling but you can more than double it if you are a sweet freak. I have never met a man who didn’t love it, well…maybe one. My friend Russel doesn’t care for anything with lemons. But his wife Claire adores lemon so this pie is for her and Mom…and my brother Christopher who often requests this pie when he is in town. If I have them, I always use Meyer lemons for this recipe. 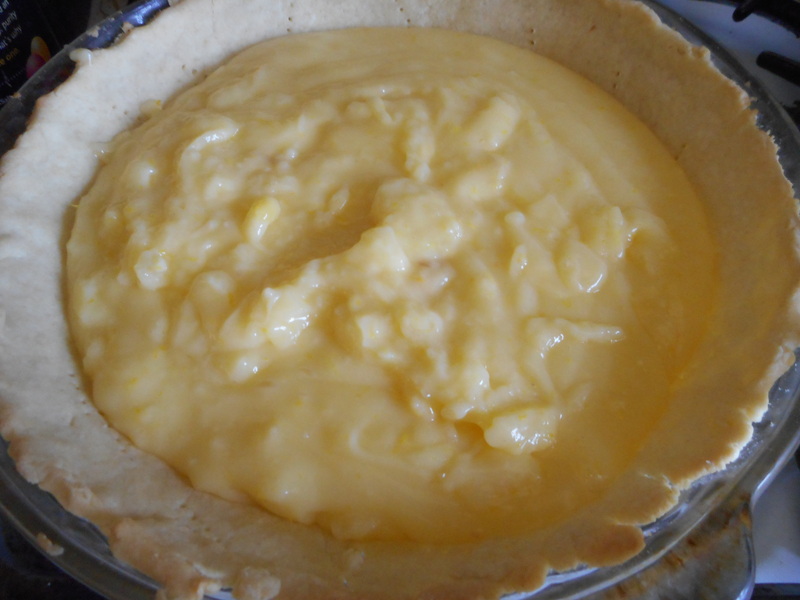 Your pie will have a delicate flavor – so light I sometimes call it lemon cloud pie! Don’t worry; regular lemons work just fine. It can be difficult to find Meyer lemons and pricy too. I have never gotten my mom to admit it but I am positive she added extra egg whites to her meringue. 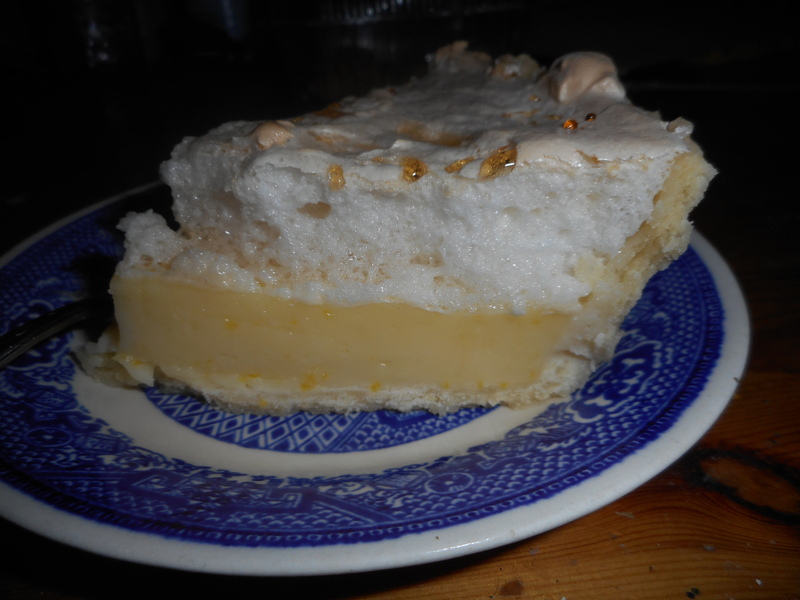 Her pie was towering with the white fluffy stuff unlike my nearly level pie made with just three whites. It is up to you how impressive you want your dessert to look. But if you have company you might want to go for the big bang of a four- five egg white meringue topping for maximum wow power! My mom added the corn syrup to replace some of the reduced sugar and because it makes the texture of this pie creamier and more delicate. 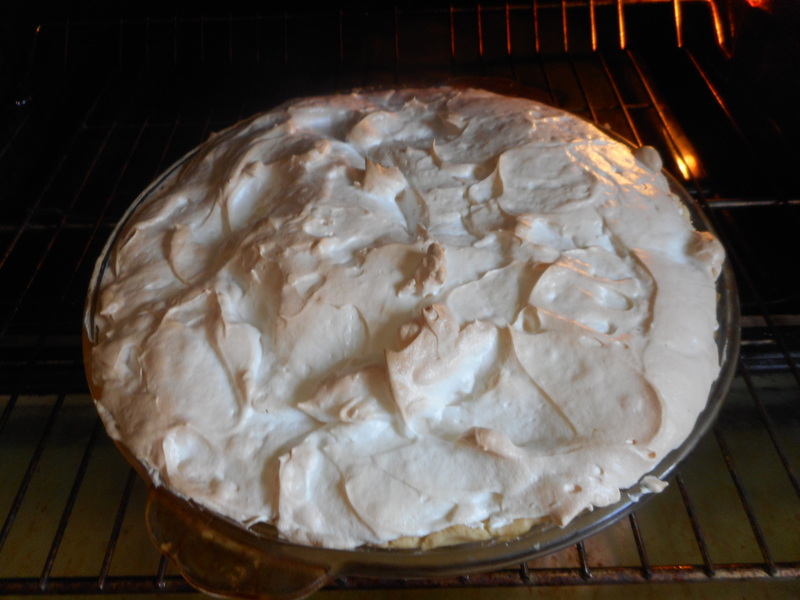 Don’t make this pie on a very humid day or the meringue will weep and bead on the top. It will taste fine but the look will suffer from the humidity. Thickened cornstarch, sugar and water mix all stirred up. Mix dry ingredients in bowl of stand electric mixer. Add butter and mix until crumbly and resembling coarse meal. Add egg and juice. Mix until it comes together into big chunks. Shape into a ball with your hands. Put it on a crust sized piece of wax paper (14 x 14 inches more or less), flatten the crust ball some; put on top of it another piece of wax paper and chill it all in your fridge 15-20 minutes. Then roll it out and line a 9 inch pie pan with it. Make sure you get the middle nice and thin; this crust can be tough to get the center as thin as the edges. Prick it all over with a fork to keep it from bubbling out and bake the empty crust at 375 for 10-12 minutes until light brown. Let cool to room temperature. 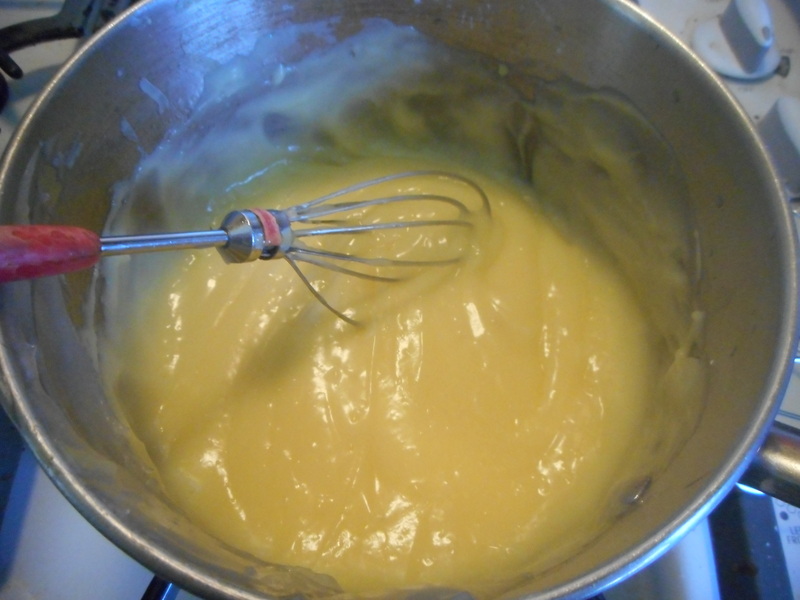 Mix the sugar and corn starch in a heavy bottomed medium sized saucepan. Add the water, stirring. Heat until it boils, stirring constantly, boil one minute, take off heat. 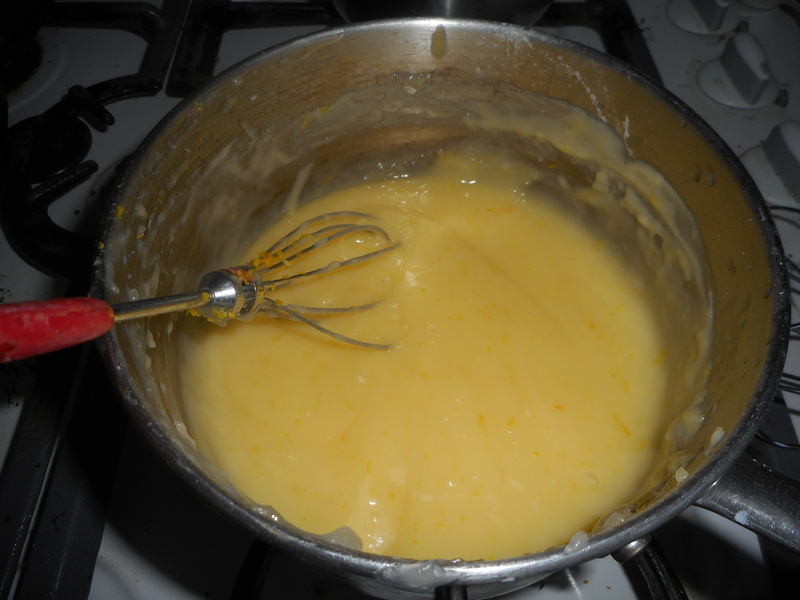 Beat yolks briefly in a small mixing bowl, then add the hot stuff slowly to it; half the hot mixture, stirring constantly. Then dump it all back into the saucepan, bring to a boil, stir like a crazy person so it doesn’t scorch. Boil 1 minute at medium heat. Remove from heat and stir in the butter. Let it melt as you stir. And then stir in the lemon juice and zest. Glug in some corn syrup. Pour the hot lemon filling into the pie crust. Top while still hot with the meringue you just beat up. Make sure you get the meringue all the way across the top and along every single edge. No cracks, no gaps. Bake it 10-11 minutes until light brown. Cool to room temperature (avoid drafts while it cools) and then chill your masterpiece for 2-6 hours. Slice and serve. Makes six-seven lovely slices. This slice is from the second day; we were in a feeding frenzy and forgot to take a picture when the pie was cut and served. It is a tad weepy from the passage of time. Beat the three whites and the cream of tarter until it is past the foamy stage, add the sugar half a tbsp. at a time beating on high until the whites are stiff and glossy. This will take several minutes. Greek yogurt is the latest power dairy snack, favored by teachers, moms, office workers and many others seeking a portable tasty yet healthy snack. I eat it too. But sometimes I want a more basic, yet way above average, yogurt. My little secret for great yogurt is the brand; Stonyfield Organic. I buy the large 32 ounce container of plain unflavored; cheaper than small ones and I can use a bit for cooking and the rest for lunch or snacks. I usually get the one percent low fat yogurt. Organic milk makes amazingly creamy flavorful yogurt, far superior to any made with non-organic milk. Occasionally I treat myself to Stonyfield’s whole milk yogurt. This is thick, creamy and oh so delicious. The top layer is like cream yogurt; crazy yummy! I eat a dish of this yogurt with fresh jam, all that jam that I don’t eat on toast anymore. I know, whole milk. But sometimes you have to enjoy the best that life can give you and frankly experts say that non-fat yogurt is less healthy than yogurt with some fat. Go on, live wild and try this fabulous organic yogurt. 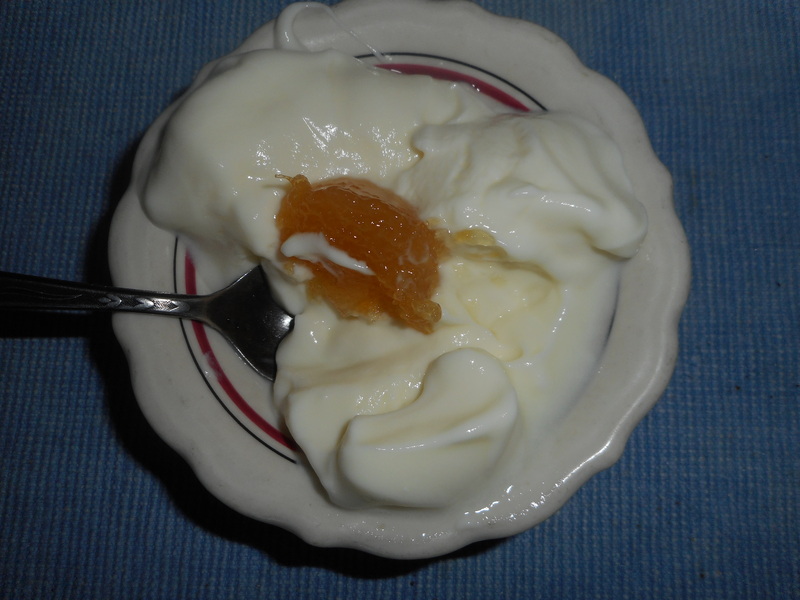 You can also enjoy this yogurt with honey drizzled on top. Sprinkled with my homemade granola it is very healthy, filling, and delightful tasting. 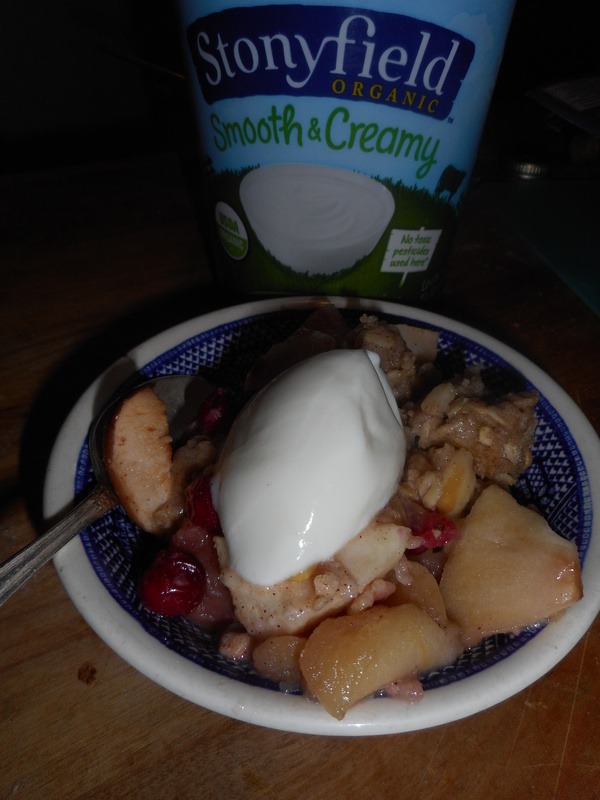 It is also a great topping for apple crisp, smooth delicate flavor to match with the spicy crisp. My latest version is with homemade lemon marmalade spooned on top. Simple, clean tasting and tangy, a perfect after work snack before doing afternoon tasks. Here is the lemon marmalade recipe if you want to whip up a batch. It is much in favor with my friends and family. Great on toast too. I bet it will taste great made with regular lemons too. It is pretty easy to do; lots of chopping up lemons and stirring the preserves as they cook. But the effort is well worth it as the lemony flavor is outstanding and buying some at a store will set you back quite a bit for a small jar. Yours will have more fruit in it and less stuff; two ingredients if you don’t count the water! Make your jam reputation on this winter treat! Lemon delivery from my brother Robert in Texas. Yumm! Meyer lemons are very fragrant and have a less sour taste. The rind is quite edible. I make candied lemon peel sometimes after making lemoncello. That is another blog post though! The day you can it up: you will need 6 half pint Mason jars, heated to boiling in a big pot of water. Along with the lids and rings also heated. The lids must be new ones. You shouldn’t boil them more than a few minutes; turn down to low. Halve lemons crosswise and remove seeds and reserve them. Quarter each lemon half and thinly slice. Tie seeds in a cheesecloth bag. Combine with bag of seeds and water in a 5-quart nonreactive heavy pot (I use my cast iron enamel coated pot) and let mixture stand, covered, at room temperature 24 hours. Bring lemon mixture to a boil over moderate heat. I leave the seeds in for this part too. Reduce heat and simmer, uncovered, until reduced to 4 cups, about 45 minutes. Remove seeds; let the liquid drain off into the pot; full of pectin so your marmalade sets up! Stir in sugar and boil over moderate heat, stirring occasionally and skimming off any foam, until a teaspoon of mixture dropped on a cold plate gels, about 25 to 40 minutes. I scoop out any seeds that got in by accident! Ladle hot marmalade into jars, filling to within 1/4 inch of top. Wipe rims with dampened cloth and seal jars with lids and rims. Put jars in a water-bath canner or in a deep pot. Add enough hot water to cover jars by 1 inch and bring to a boil. Boil jars, covered, 5 minutes and transfer with tongs to a rack. Cool jars completely. The lid should vacuum seal within minutes of you setting them to dry and cool. This is two batches together. That white stuff is gf flour mix on my cutting board. I like to let it ripen for 3 or 4 weeks before opening a jar. 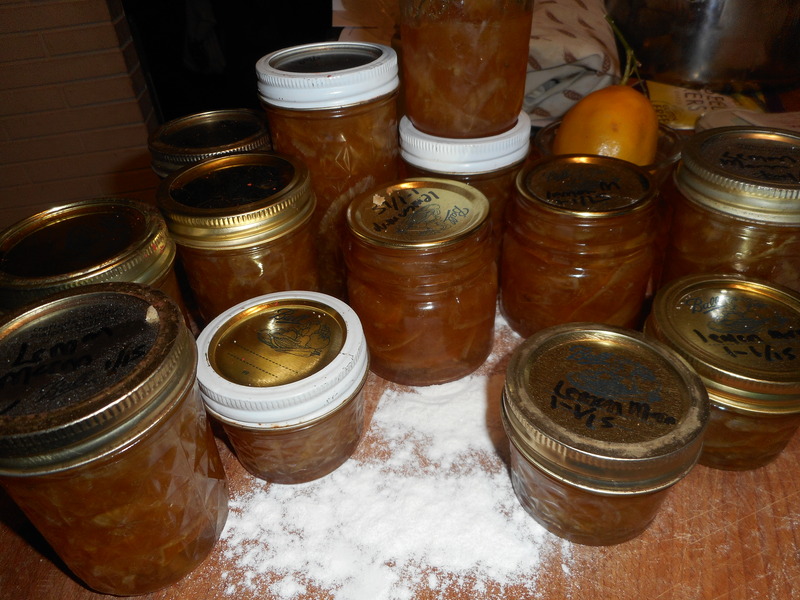 The jarred marmalade keeps a year in a cool dry place out of the sun; basement shelf works great. Any extra marmalade that isn’t enough for a jar goes in the fridge and gets eaten within a few weeks. Original recipe came from epicurious. com. 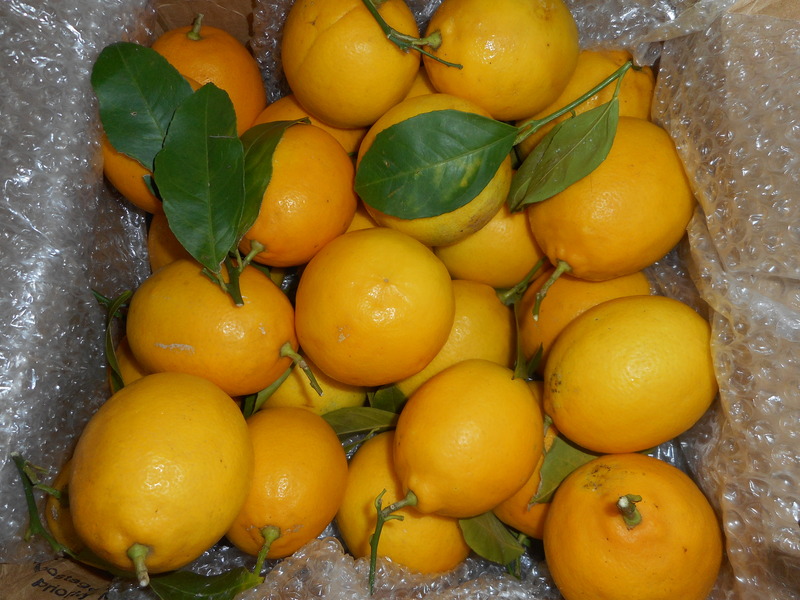 My brother Robert sends me a big box of fat and juicy Meyer lemons from his trees every November. Like 15 of them, nestled into packing material with stems and leaves attached, fresh from his tree! The box releases a cloud of lemon scent when I carefully slice the packing tape open. November and December are the season of perfect Meyer ripeness. Meyer lemons are a cook’s dream. Their flavor is sweeter than store lemons; not all that tart, with a gorgeous floral scent, perfect in cookies like the lemon squares everyone loves, which I make gf now a days. I also make lemon meringue pie, lemon marmalade, lemonade and this delicate yet gorgeous buttermilk tart. Which I am sharing with you today. It is very easy to construct; I use a shortbread cookie style, gf, press and bake crust and the filling is just whisked together and poured into the partially baked crust. 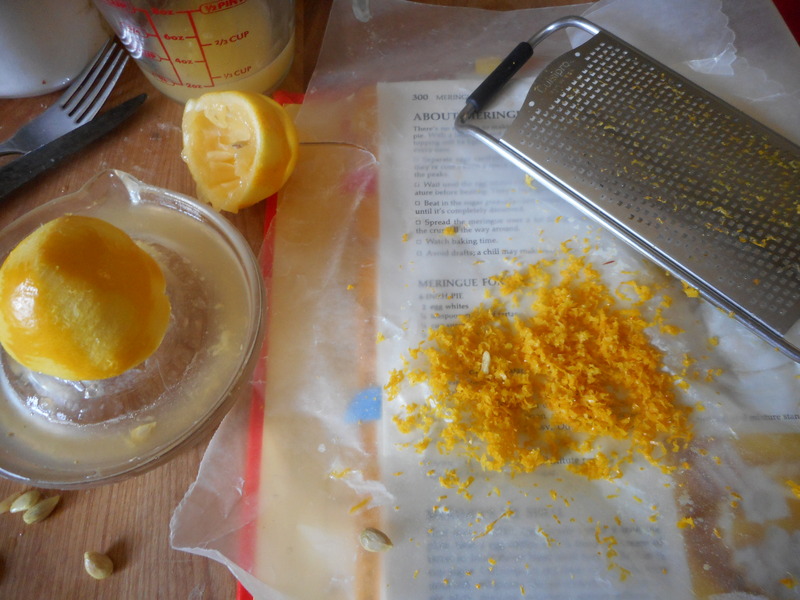 Be sure to use a fine grater to carefully remove all of the lemon peel onto a slice of wax paper before you halve it to make the juice for the filling. I used one big fat lemon plus a little bit more; 2 medium sized ones will work great. So easy to bake up and it is perfect with a big spoonful of fresh real whipped cream. Sometimes I lay slices of Meyer lemon down the length of it when I use my special rectangular tart pan. Sensational looking and just as yummy as it looks. A round tart pan works great too. I have used a regular gf pie crust which is a tasty alternative to the cookie crust. You could make it with regular lemons but I suspect it would need more sugar to make it sweet enough as Meyer lemons are far sweeter than the grocery store lemons. I think a few places may carry Meyer lemons; check at Wegmans. If you want to use all purpose flour in your crust and in the filling – go right ahead. I have been making this tart since long before I went gluten free: simple, tasty, and impressive looking – tart perfection! 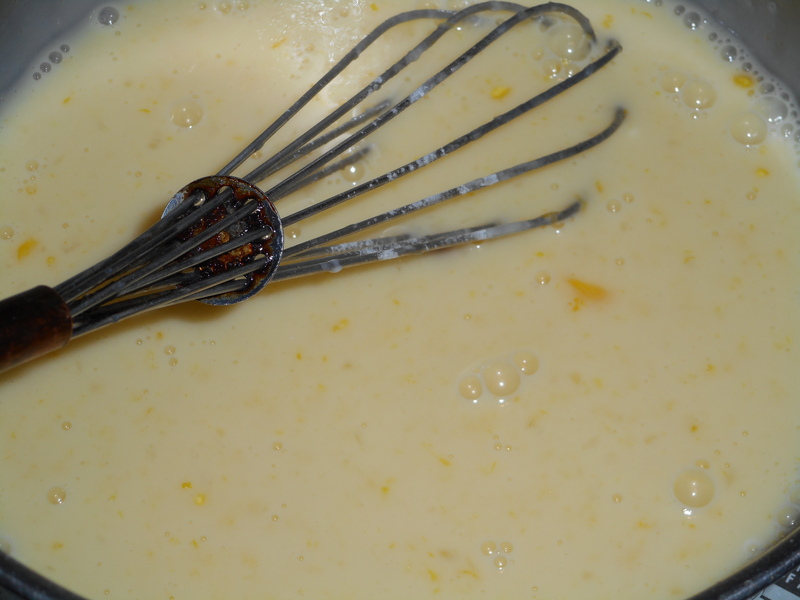 Mix the dry ingredients in your stand mixer, add the butter, blend with the paddle blade until the butter is small pebbles. Add the vanilla and water. Press into a tart pan with a removable bottom, be sure to first spray the pan with cooking spray. Don’t press too hard or you will over compact the crust and it will lose the delicate texture that makes it delightful. Bake 10 minutes in a 375 degree oven. Cool 10-20 minutes before filling and baking. Mix all filling ingredients in a mixing bowl until smooth. Pour into crust and bake at 325 degrees for 25-30 min; until just barely set. Cool completely and refrigerate until chilled. Can decorate tart with thin slices of Meyer lemon tart. Serve slices topped with a dollop of this lightly sweetened cream. Beat cream, add powdered sugar. Serve a dollop with each slice of tart. Filling recipe modified slightly from one on food network.com, flour mix and crust from Annalise Roberts, Gluten – Free Baking Classics.